Looking for home insurance? Whether it is building or contents insurance that you require, you can compare policies from a range of home insurance providers to help you get the right cover for you needs. This is a list of featured home insurance providers. 20% discount when buildings and contents are taken out together. Fully comprehensive cover for your buildings and contents from Britain’s most ethical insurer. Cover buildings up to £500,000 and contents in the home are covered up to £50,000. Buildings Insurance covers the structure of your home and other permanent structures on your land such as garages, outbuildings, drives, walls, against damage by fire, flood, subsidence and other specified causes. John Lewis Finance has been awarded Which? Recommended Home Insurance provider for the 7th year in a row. With our Home Insurance, the difference is in the detail. Defaqo rated 5 star Premier Home Insurance. Recommended by 95% of customers. Based on a survey of 710 customers. Trust us, to trust you. Individual possessions up to £3,000 don’t need to be itemised. An excellent level of cover with flexible extras to suit your needs. Buying home insurance can be confusing. 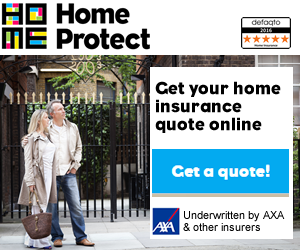 That's why the AA compare home insurance quotes from a selected panel of the UK's leading insurers to find one that's right for you. AA Home insurance has received a 4 Star Rating from Defaqto* and offers three types of home insurance to choose from – buildings insurance, contents insurance, and combined buildings and contents insurance. *Defaqto is a financial information business, helping financial institutions and consumers make better informed decisions. Click the link to start a new quote. Basic Legal Expenses and Home Emergency cover. Up to £5 million public and personal liability cover. 24hrs Claims phone line. HomeProtect covers a vast array of circumstances including people with criminal records, properties with a claims history, subsidence, previous flooding, UK holiday homes and so more! If your home or personal situation is a little unusual, then we can help. Choose from Buildings only, Contents only or a combined policy and customise your cover with Full Legal Expenses Cover and Full Home Emergency Cover for added peace of mind. Home Emergency cover offers protection from a wide range of unexpected emergencies that can affect your home. Covering emergencies such as burst pipes, hot water failure, central heating failure and more. Nova Direct can offer peace of mind 24/7 with our home emergency cover. Policies starting from £55.